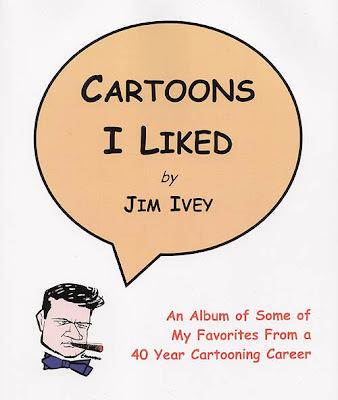 I'm happy to announce that a new retrospective of Jim Ivey's cartooning career is now available. "Cartoons I Liked" is a compilation of some of his personal favorite cartoons from a long and distinguished career at the Washington Star, St. Petersburg Times, San Francisco Examiner and Orlando Sentinel. In addition the book offers some rare unpublished material, including rejected editorial cartoons and comic strip submissions. If you are a longtime Jim Ivey fan or have just recently discovered him through his weekly comic strips on the Stripper's Guide blog you're sure to enjoy this book. Jim Ivey’s editorial cartooning career spanned 1949-89. He was a political cartoonist at the Washington Star, St. Petersburg Times, San Francisco Examiner and Orlando Sentinel. His work was also syndicated through the Chicago Tribune and Ben Roth Agency. His uncluttered style rejected the grease-crayon and label-littered conventions of editorial cartooning and ushered in a new era of experimentation and graphic inventiveness in the field. This is a collection of Ivey's favorites spanning his entire career. In addition to editorial cartoons there are several bonuses including rare unpublished drawings and syndicate submissions. 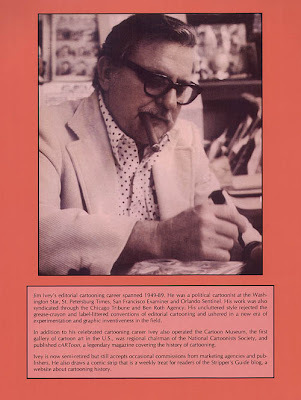 In addition to his celebrated cartooning career Ivey also operated the Cartoon Museum, the first gallery of cartoon art in the U.S., was regional chairman of the National Cartoonists Society, and published cARToon, a legendary magazine covering the history of cartooning. Ivey is now semi-retired but still accepts occasional commissions from marketing agencies and publishers. He also draws a comic strip that is a weekly treat for readers of the Stripper's Guide blog, a website about cartooning history.